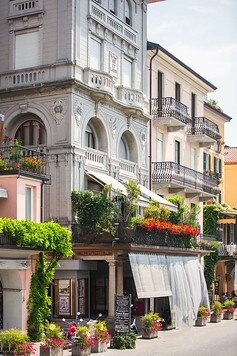 The Pearl of Lake Como is perhaps the most famous town in Lake Como. When we were planning our visit, I thought it was funny that despite the lake being named after the town of Como, most people skip that stop altogether and head straight for Bellagio or Varenna. 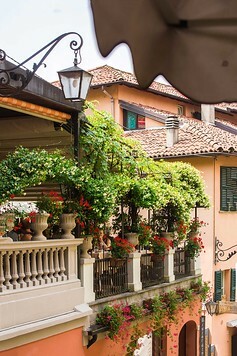 Bellagio is the prefect town in Italy if you’re looking to getaway and relax. While there are lots of other tourists, the tiny town retains a really charming atmosphere and I loved how there wasn’t any hurry to cross off any big ‘to do’ list of museums and famous sights. Instead, we spent our time window browsing, watching street performers and carbo loading! 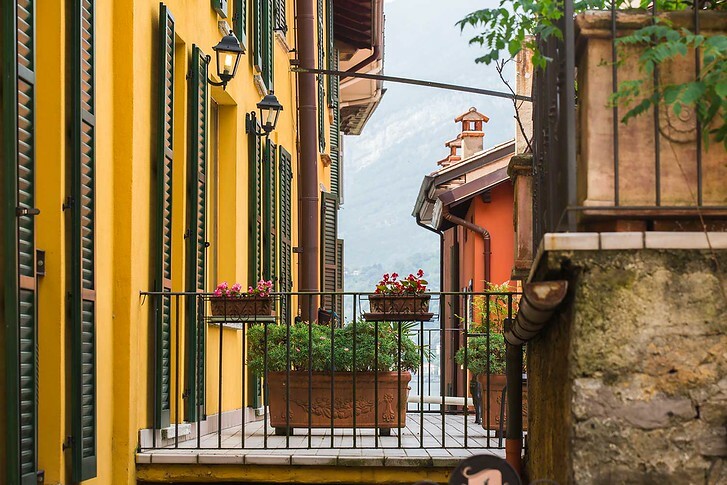 Here’s a quick travel guide about what to see and do in Bellagio, Italy – even if you have just 1 day! It’s relatively straight forward to get to Bellagio if you’re already in Italy. First, take the train from Milan’s Central Station to Varenna. We purchased our train tickets from Rail Europe and the process was easy and straightforward. You can browse their website for the Italy train schedule here. Tip: In Italy, train fares increase with time, so book your tickets once you know your travel dates. 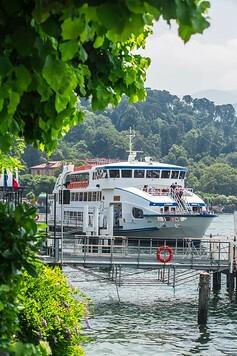 When you arrive in Varenna, you’ll then need to take the ferry. 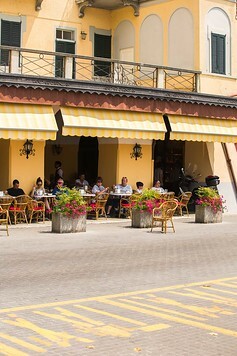 The train station in Varenna is a short walk (maybe 5 to 10 minutes) from the ferry dock. 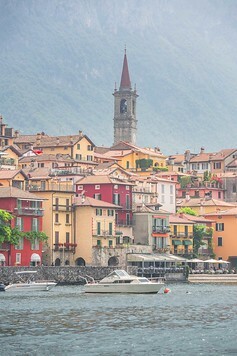 While there are lots of towns in Lake Como to base yourself in, Bellagio is one of the most convenient since the ferry boats which service Lake Como typically make a brief stop at Bellagio on most routes in either direction. You’ll receive a time table when you buy your ferry ticket. As we rode the ferry over from Varenna, the slow pace only heightened our anticipation. First we spotted a church tower and colorful pastels from far away and as we inched closer and closer, our jaws dropped. 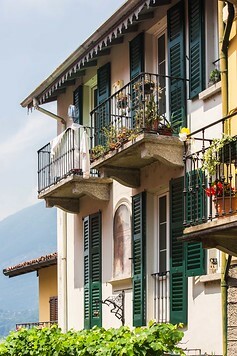 Bellagio is one of the larger villages on Lake Como, with tiered hills of pastel buildings. When you land, there are two docks, each separated by just a couple hundred yards. Right opposite is a large promenade of hotels, restaurants and shops. There’s also people everywhere! 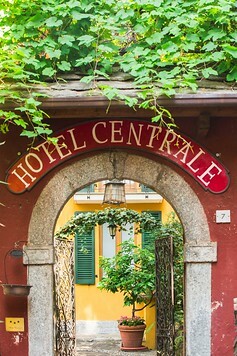 Bellagio has lots of options for those who want to spend a weekend or relaxing couple days on Lake Como. There’s luxury grand hotels right on the waterfront, boutique hotels for those wanting a more family feel with modern accommodation, and of course, Airbnb. 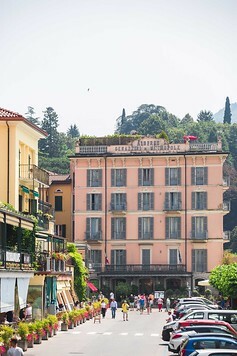 1 | Hotel Belvedere Bellagio – Perched high on a hill, Hotel Belvedere is a landmark Bellagio hotel that’s famous for its incredible pool, rooftop restaurant and stunning views of greater Lake Como. The rooms are large and airy and you’re pretty much guaranteed to never want to leave! 2 | Hotel du Lac – On the flipside, Hotel du Lac is the perfect place to stay in Bellagio if you want to be in town near all the action. It’s right in front of the ferry docks and surrounded by great restaurants, boutique shops so if you love being in the center of action, stay here. We had fun exploring the side streets and walkways. There’s everything from jewelry stores and hat stands to luxury designer boutiques. Shopping is the main thing to do in Bellagio so join in on the fun! 2. Eat, Eat & Eat! Bellagio has lots of great options, whether you’re craving pasta, pizza or tiramisu! We used Rick Steves Italy guide to get a sense of some local hotspots and ended up picking a restaurant with AC to escape the heat! 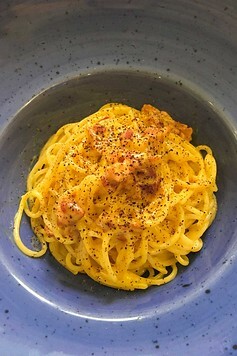 Our lunch was pasta heavy (carbonara and clams) and delicious. Expect slightly higher prices given the town caters to tourists. For a full list of restaurants recommended by the Michelin Guide, check here. Villa Melzi is a fabulous villa that was built… for Napoleon’s assistant. Must have been one right hand guy! The manicured growns are gorgeous and as a bonus, have incredible views of the lake! 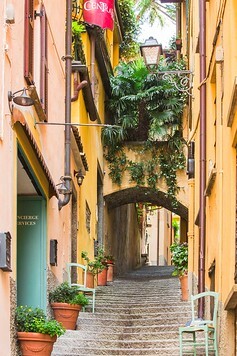 It’s only a short walk from the main town but pretty unknown… unless you take the Hidden Bellagio tour. If you have more time, this 4 hour cooking experience is fantastic. You get to learn all the secrets to making authentic Italian cuisine in a pretty villa. 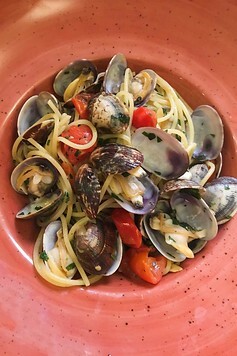 They pick you up from the ferry bank, teach you lots of Italian dishes and appetizers and best of all, it’s capped to just 12 people so the cooking class is more intimate and everyone has more than enough to eat at the end! We didn’t have time for this but kayaking on Lake Como looked so fun! Starting from Bellagio, you paddle all along Pescallo Pay and learn from a local guide about the region and hidden sites of Lake Como. If you have a waterproof camera or GoPro, bring it! Kayaking brings you around the hills so you get some amazing views of the landscape and villas (Serbelloni, Marescalchi, etc) from the water. What are you most looking forward to about Bellagio? 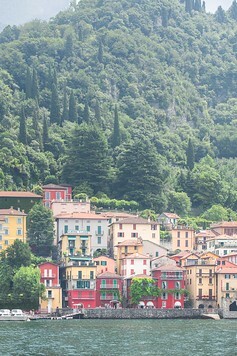 Check out the rest of our Lake Como travel guides below!